The southern part of the Caribbean island of Sint Maarten is a self-governing country within the Kingdom of the Netherlands since 2010, when the Netherlands Antilles were dissolved. It is a major tourist destination and, though small, has a large number of coaches for tourist transport. Most are mid-sized or small vehicles, with a few large ones. Company names are rarely displayed so we organised the pictures by bus model. The large buses are several Hyundai, a Volvo -Marcopolo, a Zhongtong Creator and an IVECO (out of service). At the airport a Gillig Phantom is used. 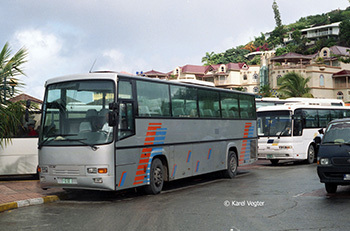 Some older pictures are also included and show secondhand Dutch buses (BOVA, Smit Joure). Several ex-US school buses are used, some not as buses. We grouped those, apart from the “Da Party Bus” which merits its own page (see also their site http://www.thestmaartenpartybus.com/ ). Public transport vehicles are all mini- and midibuses. There is a special page for those. Registration plates consist of one letter followed by a number, except for public transport vehicles which use “BUS” and a number. Letters are G for “groups transport”, such as contracts and schools, P for private vehicles, M for trucks (supposedly “Merchandise”), T for tourist vehicles and R for rental vehicles. V was seen on a library vehicle. The distinction between G and T is not very clear in practise. The Coast Guard services are provided by the Dutch Navy and a Toyota Hiace seen had a Dutch Navy registration.